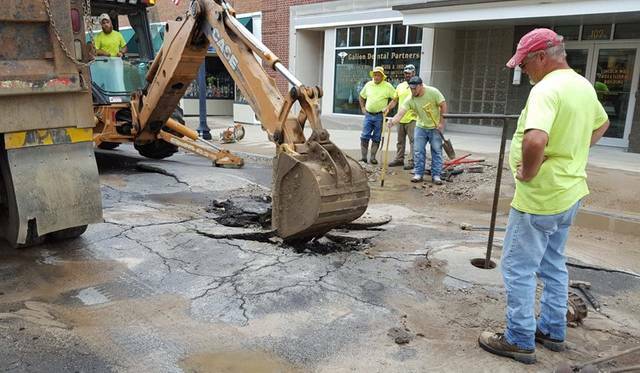 Update: Unless otherwise notified, a boil advisory remains in effect until 8 p.m. tonight for residents and businesses from Harding Way from the square to South Boston, and for North Union from Harding Way to Church Street. Unless notified otherwise. 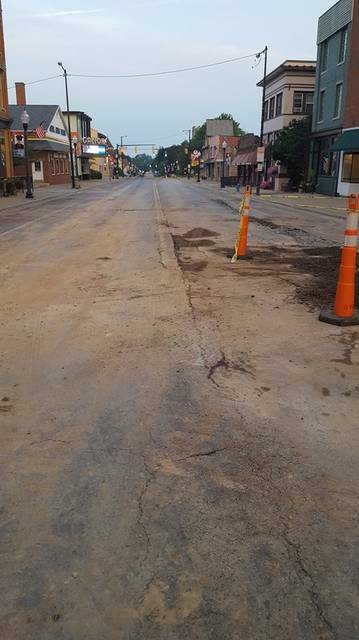 GALION — The clean-up is pretty much complete, but Harding Way West in Galion is not yet ready for traffic and remains closed from Union Street to the square. A water line break about 2 p.m. Tuesday — just west of the square — resulted in thousands of gallons of water rushing down Harding Way, into storm sewers and some basements. 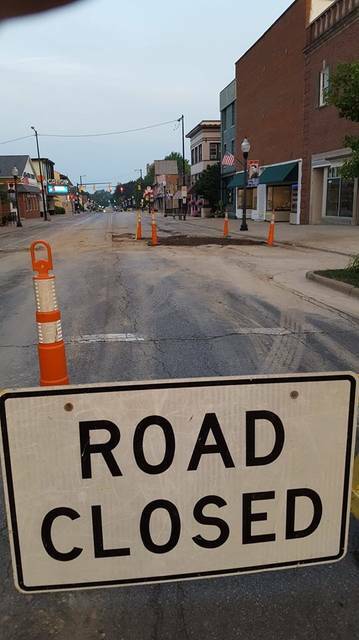 It also resulted in a large crowd of onlookers responding to the Historic Uptowne Galion to watch repairs in progress. Roads were closed Tuesday on Harding Way from Boston Street to the square about 2 p.m. Road closed signage was put up in alleys, patrol cars were placed in major intersections and detours routed motorists around Harding Way West. The force of the water beneath the road after the break buckled Harding Way from the square south, to about halfway down the block. Repair crews were on site within minutes. The city shut off water leading to the area, leaving a few addresses without water while repairs were being replaced. An alert from the City of Galion advised residents that water may be filled with rust. It urged them to run water until it was clear and not to do laundry with rusty water. A boil advisory was issued for some residents, who were notified with door hangers or through the city’s alert network. Resident can sign up to receive alerts on the City of Galion website at https://ci.galion.oh.us/list.aspx. Crews using a backhoe were digging up Harding Way by about 2:30. But they waited for Columbia Gas workers to arrive before going too far, to make sure no gas lines were cut. The leak was prepared before 7 p.m. and at 8 p.m. Tuesday, City of Galion workers were raking, sweeping and shoveling debris from curbs and sidewalks. The last dump truck and backhoes had been moved by 8 p.m.
Harding Way — between Union Street and the square — will have to be leveled and repaved. Damaged to adjacent sidewalks will have to be assessed to see if repairs are needed.